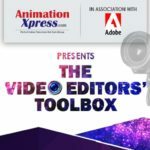 “The Video Editors’ Toolbox”, brought to you by AnimationXpress in association with Adobe, was an exciting experience to the video editors, film editors and industry artists. They got a chance to sharpen their skills and enrich their technical finesse and industry knowledge. The enthusiastic participation of the attendees made the event a huge success. Here’s some snippets from the event.